I finally tried Halo Top plus I’ve got a full day of food from Monday to discuss so let’s get started! I’ve been on borrowed time with the cheap price of strawberries for a few weeks now. I had gotten really used to strawberries and blueberries (frozen blueberries though) in my oatmeal but that breakfast is quickly coming to an end for the season. 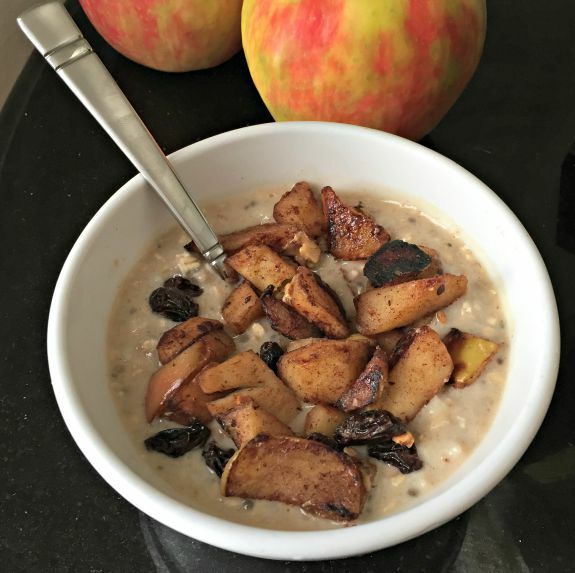 This week I went back to making my autumn oatmeal using pink lady apples. I’m trying to eat an apple a day anyway again so this was a good way to do that! As you know from Monday’s post, my mom’s birthday is September 11. 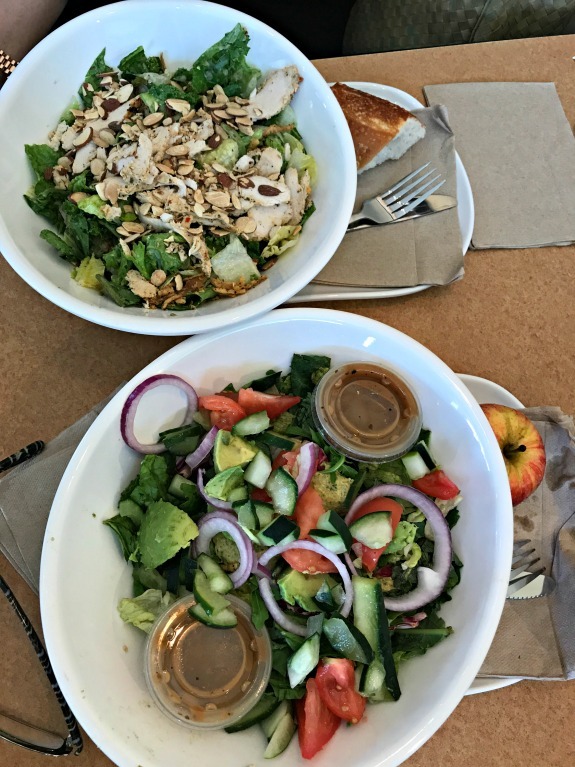 We went out for a birthday dinner over the weekend but then met for a quick birthday lunch on Monday at Panera where we did not discuss her birthday from 16 years ago. I guess we are getting better at not reliving that day over and over and over again. At least not every second on her birthday. Big salad for dinner! 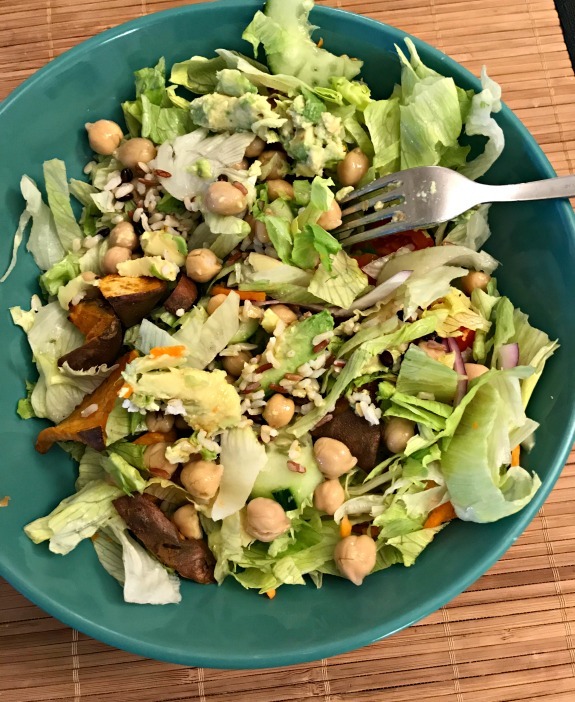 In addition to the basic house salad ingredients, I added chick peas, avocado, brown rice, and roasted sweet potatoes. I had a coupon to use at Stew Leonard’s so when I spotted Halo Top, I said okay fine, why not finally try it. I’ve avoided Halo Top all this time not only because I think it’s overpriced but because I don’t really care for these lighter style ice cream concepts. Nor do I care for the fact that Halo Top lists their calories for the entire pint. I don’t like to focus on calories (especially for dessert) and I also think that listing the entire calorie count for the pint as a focal point on the front of the carton promotes the idea of eating the entire pint which is a subject for another post entirely. Overall impression of Halo Top? Not impressed. 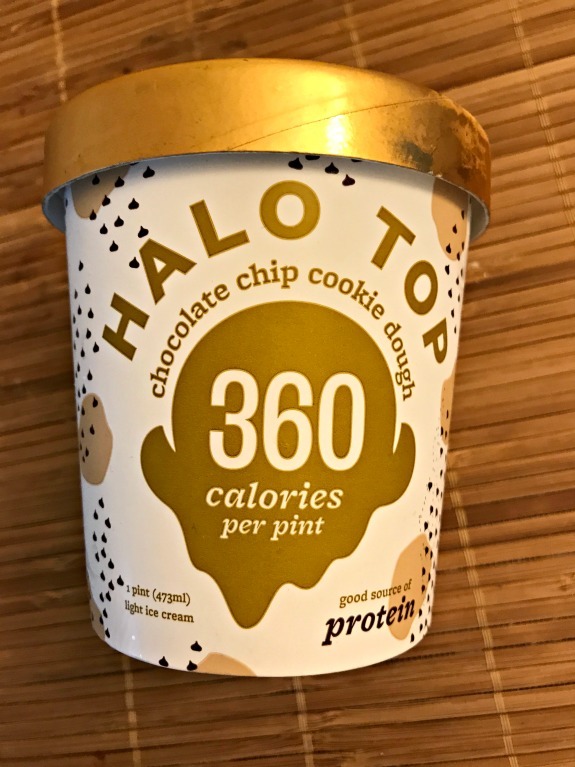 While I do think that Halo Top tastes better than Arctic Zero, calling this cookie dough flavored is a bit of a stretch. The pieces of cookie dough can hardly be called pieces of cookie dough. They are more like barely-there slivers of what you may think is cookie dough. Chocolate chips do not exist in the pint unless you try to count whatever chocolate you can find inside the barely-there pieces of cookie dough. The texture and taste of the ice cream was fair but I would need to load this container up with chocolate chips to reach a level of satisfaction that I want from dessert. I won’t be buying Halo Top again. If I want ice cream or frozen yogurt, I would prefer (as I figured I would) to buy the real thing with real toppings and call it a day. Be sure to visit Laura’s blog today for the rest of the What I Ate Wednesday fun! What is your opinion of Halo Top? Which flavor, if you like it, is your favorite? Do you usually add your own toppings? I’ve only tried HaloTop once, it was the oatmeal cookie flavor, and I agree… It was just OK. I probably wouldn’t go out of my way to buy it again, but if I did I would definitely add toppings! Toppings are the best part! I can’t do Halo Top..the ingredient list–I can’t pronounce some of the them. Have you tried the Almond Milk or Cashew Milk ice cream by So Delicious?? Really good!! I didn’t even read the ingredient list and definitely won’t now! lol. I haven’t tried So Delicious but if I see it on sale, I will! I’ll get halo top occasionally when it’s on sale and I have s coupon. Otherwise, it’s over price for and over hyped. I haven’t tried Halo Top but I like the idea of a less guilty dessert option. Whenever it’s on sale, I consider buying one just to try. One thing I’ve heard is that certain flavors aren’t as good as others so I don’t want to buy a bad flavor and say the whole brand is bad. I had a coupon for a free pint and wanted to see what all the hype was about but in the end, it was too fluffy, like mousse and I do not like mousse at all! Pass! I’m glad I tried it but I probably won’t bother again! Haha as I’m sure you know, I love Halo Top! The peanut butter one is my personal fav. Obviously I wish there were more cookie dough chunks in the cookie dough one 😉 but I like it for what it is! When I want a sweet treat at night, halo top is one of my go-to desserts! But I agree, it’s not Ben & Jerry’s! I haven’t tried Halo Top – if I am going to eat ice cream, I want real ice cream. I used to bake with applesauce, but now I am not a fan of “less-guilt desserts” – especially ones like Halo Top that have questionable ingredients. I would rather have less of the real thing! I’m glad I didn’t even look at the ingredients before trying the halo top lol. I probably would have skipped it altogether. Aww I’m sorry you weren’t impressed by Halo Top. You should still try some other flavors 😉 red velvet and the plain vanilla are so good! I often top the vanilla with some Justin’s almond butter. And your breakfast looks amazing, btw. thanks – I do love that oatmeal with the warmed cinnamon apples! This is exactly how I feel about Halo Top, Artic Zero and all the rest. If I want ice cream, I’m gonna eat ice cream, not some artificial knock off packed with weird ingredients and protein. Blech. Give me the good stuff any day of the week. See, this is why we’re friends. Calorie counting is the biggest buzz-kill. We don’t have Halo Top up here (we rarely get these new trendy diety foods in Canada) and IDGAF. I’m not really into ice cream anyway. If I ever get ice cream, it’s usually a Blizzard or McFlurry with extra add-ins and I end up just eating the M&Ms and leaving the melted ice cream. major buzz kill! I used to love a good blizzard, I really need to get one again now that they opened Dairy Queen in my area! thanks for the reminder. I’ve tried Halo Top chocolate and oatmeal cookie flavors. Both were rather meh on flavor. Oatmeal cookie was a bit better, especially served over warm apples sprinkled with cinnamon. (There’s another apple-a-day for you!) But I would definitely not go out of my way for it again, especially not at that price. over warmed apples is definitely a great idea! Ive never tried Halo Top but I would rather go for the real thing too. Im not usually a fan of stuff like that- Im guessing they use alot of fake sugar to keep the calorie count low?